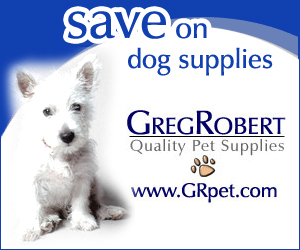 We have taken the time to find discounts and coupons for quality pet products. We encourage everyone to check here to compare products before you buy elsewhere. NITE BEAMS™ LED pet collars are a 'must have' for pet owners concerned about the safety of their pet(s). LED Pet collars are made of high quality, durable, water resistant material that will last for years. They provide visibility from a distance of up to 1400 ft. or approximately ¼ a mile, giving motorists ample reaction time and providing you peace of mind. Any pet out-of-doors after dark, whether they are leashed or not, should wear a NITE BEAMS™ LED pet collar. Available in Red, Blue, Green, white, Pink and Orange. TO ORDER: www.nite-beams.com receive a special discount ! Synthetic Tracking Line - 18 Ft. These collars are available in 2 sizes at this width. All of these collars are handmade by the Amish and either riveted or sewn for added strength. We have found that we like these 1/2" wide collars for our newborn puppies, the smaller sizes and miniature breeds of dogs.